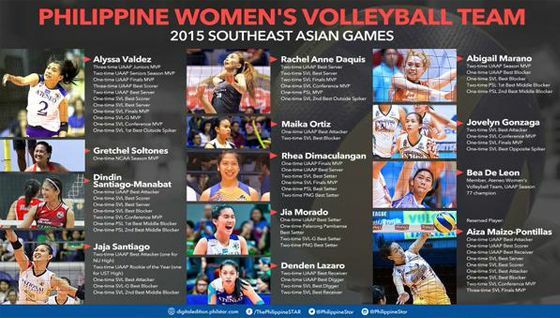 Philippine women's volleyball team for 2015 SEA Games - Balita Boss! After a 10-year absence, the Philippine national women’s volleyball team is now ready to return in biennial multi-sport event in the 2015 Southeast Asian (SEA) Games from June 5 to June 16, 2015. The volleyball competition will begin on June 10 at OCBC Arena Hall 2 in Kallang, Singapore. The Philippine women's volleyball team will try to duplicate their bronze medal finish in the 2005 SEA Games, against SEA Games member-countries. The Philippines won a total of six gold, two silver, and six bronze medals in the tournament since joining the games in 1977. Philippines' volleyball superstars Alyssa Valdez, the flag-bearer for Team Philippines at the 2015 SEA Games, Rachel Anne Daquis, the 2015 Philippine Super Liga All Filipino Conference MVP, and captain Jovelyn Gonzaga will lead the 12-woman team that will compete in the tournament. Aiza Maizo-Pontillas missed the final cut for the national roster, Larong Volleyball sa Pilipinas Inc. (LVPI) president Joey Romasanta announced the list on via Sports Radio. Philippines is in Group B along with the Vietnam, Malaysia and Indonesia. The women's volleyball team will kick-off their campaign against the Indonesia on June 10.